"Canzon II" - Marcin Mielczewski. Proclaimed a “new star in the firmament”, In Stil Moderno is clearly one of Holland’s most exciting baroque ensembles. Passionate playing combined with musicological discoveries and insights make every concert by In Stil Moderno a special event. With its unusual instrumentation – two baroque violins, three baroque trombones and organ – and exciting repertoire “impeccably performed by virtuoso players”, In Stil Moderno has won acclaim from press and audiences alike. The internationally renowned members of In Stil Moderno came together in the Netherlands to explore the world of seventeenth-century music. They have created programmes containing unknown and unpublished repertoire, as in their “Crown Jewels of Kromeriz” programme, that commanded international attention. Invited to perform at the Prague Early Music Festival, their discoveries were heard on television and radio, as well as in concert. 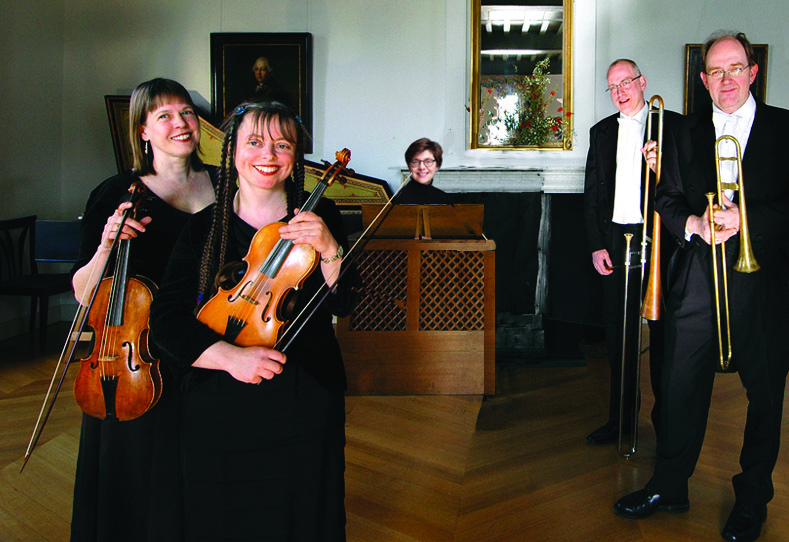 In Stil Moderno has been invited to perform in numerous prestigious series and festivals, including two Dutch Early Music Network tours, the Prague Spring Festival, the Utrecht Early Music Festival, the Historical Brass conference (Paris), and the East Cork Early Music Festival (Ireland). They have enjoyed collaborating with many prestigious choirs, including the Grote Omroep Koor (the Netherlands) and Currende (Belgium), performing repertoire from Monteverdi’s Vespers to J. S. Bach. Their two CD’s “Musica Polonica” and “Musica Venetia” were greeted with international praise.